Manchester United had to wait until injury-time to eke a victory against Young Boys in the Champions League, which saw manager Jose Mourinho smash water bottles into the ground. After a 1-3 loss against arch-rivals Manchester City in the Premier League before the break, United had to get a response going. The side was held to a 0-0 draw by Crystal Palace over the weekend, and another such result was beckoning them against Young Boys as well. After an array of shots throughout the match, United wasted chances aplenty. But Fellaini’s last-gasp goal sealed the deal to give Jose the breathing space, and that propelled the Portuguese to show his emotions, which indicated just how frustrated he was seeing the progression of the match until then. Fellaini. 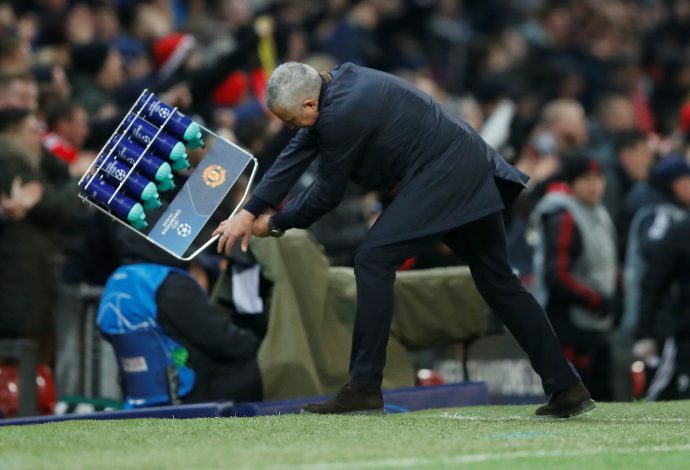 Mourinho picks the water bottle holder up and throws it into the ground. Sir Alex Ferguson's smiling. @ManUtd going through. The performance of his side against a team that low highlighted the dismal season United have been continuing. There have been some goals this season right at the death for the club that led to wins, and on Tuesday, the late victory provoked strong emotions from a manager under pressure. The goal salvaged United’s night, which until then, had a writing on the wall. Jose might have been left frustrated seeing Marcus Rashford spilling the best chance of the match early in the 1st half. Jesse Lingard had redirected a ball into midfield by Luke Shaw, and the young England international was through with just the goalkeeper to beat. But the youngster missed, and Jose was left a sorry figure. The gaffer had returned to the dugout with his arms wide open in shock and disbelief. And as the night progressed with no luck, Fellaini’s effort in the end drew that piece of raw emotion from Jose.